Still from Airport’s 2016 video A World Alone, directed by Hunter Pharis Johnson. MUSIC VIDEOS ARE BACK—even the New York Times thinks so. But one of the year’s best won’t be anywhere near this weekend’s MTV Video Music Awards. The montage for “A World Alone,” the closing track of producer Airport’s cassette-tape album Lorde Playlist, released earlier this spring by label Afternoonsmodeling, marries an amateur cover by American teenager Claire Maisto of the New Zealand pop artist’s closing track to her 2013 album Pure Heroine with combat footage, tragic accident replays, and other stumblings and sheddings of sovereignty. Some clips are branded with the name “War Clashes,” possibly a YouTube channel hosting “documentary information” from wars in Syria, Ukraine, and Afghanistan. More so than any other medium, music videos have perfected the old dance between art and commerce. They leap to sell musical product but in midair throw out a double-twist reference to “art”—the ace vault blending the beating of emotional pulse, giddy intellectual stimulation, and the quick transfer of capital. Video killed the radio star, sure, but the internet killed everything, freeing us to become the amphibious culture monsters we were always meant to be without interference from taste-making industry. Airport, A World Alone, 2016. We aesthetes thrilled to Beyoncé’s shoutouts to Pipilotti Rist, Julie Dash, Anna Gaskell, and others when she poured a two-ton pitcher of Lemonade on the culture earlier this year. A video sells the song, sure, but it also makes certain the song will never rest on mere melody, lyrics, or sound. The music video takes the song and sends it down the river to stutter other contexts. Is Drake’s “Hotline Bling” about James Turrell in any way? No, but four minutes and fifty-five seconds of video have forced the two into an arranged marriage whose bonds won’t be annulled. Whatever teenagers in suburban America thrilled to most in a given year will be your soundtrack, fifteen years on, in the supermarket as you try to find the baking soda. Individuality is exhausting, a full-time job: Who but our nation’s youth has the time to commit? The sway of young peoples’ emotions over culture now seems eternal. In the throes of bent-double, half-formed personhood, we make our first cracks at identity through the expressions of others: We learn what we want to sing by mouthing others’ words and memorizing their chord progressions. Emotions profit from this dissonance, a fantasy is born, and dreams foment against a background of faraway explosions, regime change, and the winning of hearts and minds. Music is so easily exploited for power’s interests. But it’s a two-way street, and the other side ends in a cul de sac where the least powerful have nothing but containers called songs, usually popular ones, to fill with flinty feelings. In these circumstances, appropriation is a given. In 2013, the best efforts to ease the burden of youth came from that cipher outta New Zealand. Lorde was a not-a-girl-not-yet-a-woman who dressed like the token freak at school, had moves like she’d spent more time watching footage of Berlin nightclubs and 1990s hip-hop videos in her room rather than actually, you know, dancing, and wore sports bras with lots of concealer, singing “Let ’em talk cause we’re dancing in this world alone / We’re all alone / We’re alone,” practically, surprise, alone on expansive festival stages with simple backing tracks. The pop concert became the cafeteria lunch table for one, except there was an audience of kids screaming and begging for more. Crash a plane in time to her words and melodies, throw yourself off the roof, and the latent, apocalyptic emotional register of pop and the texts and narratives it holds start to seem complementary. 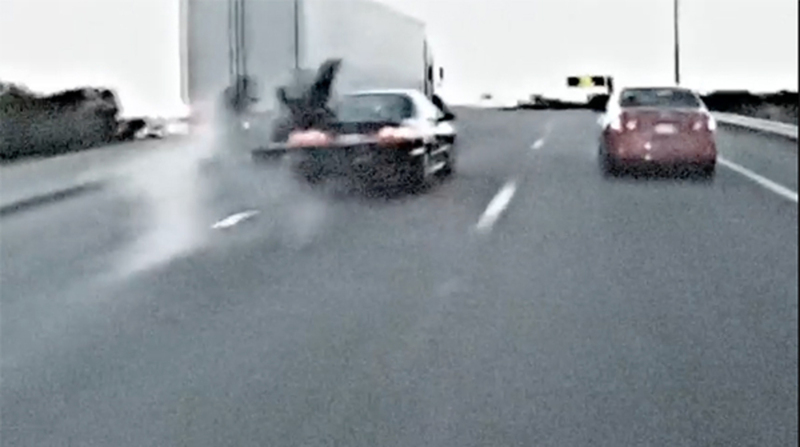 Claire sings Lorde’s words: “We’re a trainwreck waiting to happen / One day the blood won’t flow so gladly / One day we’ll all get still.” A child runs from a plume of dark smoke and a motorcyclist bites the dust. Airport’s video uses violence and pop to picture such collisions, which at their best make us feel alive, finally. Drawing a parallel between destructive forces of emotion and the explosion of global conflict, Airport’s “A World Alone” reaches for the dream that feelings could change the world—that fantasy could be a fact strong enough to slay reality. “Maybe the internet raised us / or maybe people are jerks,” she sings. Elide the “maybe” and make “or” an “and.” Over and over again, please always add and demand more. Paige K. Bradley is an associate editor of Artforum.com.